Tracheotomy is the surgical creation of an opening from the outside of the neck into the windpipe. Usually a tracheostomy tube is then inserted into the opening to allow for normal breathing. 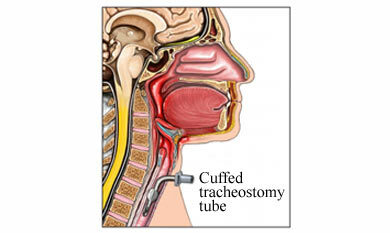 A tracheotomy is done to bypass obstructions in the upper airway that are interfering with breathing. The opening is called a stoma or tracheostomy. A stoma may be either temporary or permanent. General anesthesia will be used. You will be asleep. In emergency situations, local anesthesia may be used. It will numb the area. A cut will be made in the skin of the neck. A small incision will then be made in front of the windpipe between the cartilage. A tracheostomy tube, which will act as the airway, will then be fitted into this opening in the windpipe. The skin will be closed around the tube with stitches or clips. You will breathe through this tube as long as it is in place. Oxygen and machines to assist breathing will be provided, if needed. A chest x-ray may be needed. Anesthesia prevents pain during the procedure. You may have some pain and soreness during recovery. Your doctor can prescribe pain medication to help relieve this discomfort. The length of stay will depend on the reason for the procedure. Most stays are 1-5 days. Tracheostomy tubes need to be cared for on a regular basis. The hospital staff will teach you how to care for your tracheostomy tube. It is important follow the staff’s instructions to prevent infection and airway obstruction. Other specialists will help you adjust to the tracheotomy and learn how to speak and eat with the tracheostomy. Frequently asked questions about tracheotomy and swallowing. American Speech-Language-Hearing Association website. Available at: http://www.asha.org/slp/clinical/frequently-asked-questions-on-tracheotomy-and-swallowing. Accessed August 29, 2017. Tracheostomy. National Heart Lung and Blood Institute. Available at: https://www.nhlbi.nih.gov/health/health-topics/topics/trach. Updated December 9, 2016. Accessed August 29, 2017. Tracheostomy in Adults. American Thoracic Society website. Available at: https://www.thoracic.org/patients/patient-resources/resources/tracheostomy-in-adults-1.pdf. Accessed August 29, 2017. Tracheostomy tube replacement. EBSCO DynaMed Plus website. Available at: http://www.dynamed.com/topics/dmp~AN~T909881/Tracheostomy-tube-replacement . Accessed August 29, 2017. What is a tracheostomy? Johns Hopkins Medicine website. Available at: http://www.hopkinsmedicine.org/tracheostomy/about/what.html. Accessed August 29, 2017.